Eagles Insider: Fred Page Cup Final Tickets Go On Sale Wednesday! 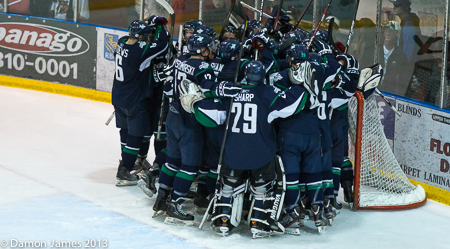 Surrey, BC - The Surrey Eagles defeated the Alberni Valley Bulldogs 5-2 on Tuesday night to advance to the Fred Page Cup Final for the first time since 2005. The Birds will face either the Penticton Vees or the West Kelowna Warriors in the BCHL Final which begins on April 12th. Tickets for the championship series will go on sale at noon on Wednesday, April 3rd. The Fred Page Cup Final is a best-of-seven series with the winners of the Coastal and Interior Conferences facing each other for the BCHL's top prize -- the Fred Page Cup -- and the right to advance to the Western Canada Cup. The Eagles will host Game 1, Game 2, Game 5 if necessary and Game 7 if necessary. Tickets will be $17 for adults, $14 for students and seniors and $11 for children. Fans can purchase tickets to all four home games. If there is no Game 5 or Game 7, tickets will be re-assigned to next season or reimbursed. To purchase tickets, call the Eagles office at 604-531-GOAL (4625) beginning at noon on Wednesday.